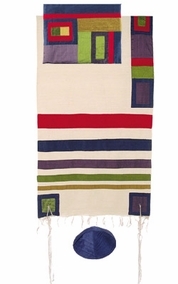 Multicolor Tallit CAT# TRS- 5, 55" X 73"
Product Title: Multicolor Tallit CAT# TRS- 5, 55" X 73"
Multicolor Raw Silk Tallit with Stripes CAT# TRS- 5. made of hand – woven raw silk. The stripes, atarah (yoke) and corners are composed of sections of appliqu?d raw silk sewn onto the tallit. Size: 55" X 73". The prayer shawl is worn over one's clothes, and is traditionally worn by Sephardi males from early childhood and by the majority of Ashkenazi males only after marriage; although some Ashkenazis criticize this practice as it delays an important mitzvah beyond the time a Bar Mitzvah male is responsible for it. In some Ashkenazi communities, especially western European Ashkenazim, all men over 13 wear the tallit gadol.